Congress - meet at the sea! 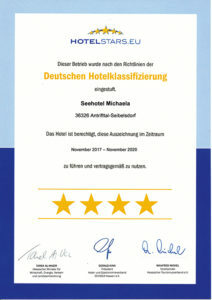 Are you looking for a meeting house with seminar or conference rooms in a central location in Germany for your meeting? 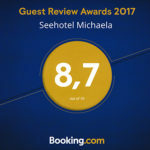 The Seahotel Michaela offers almost perfect conditions for your event. In our spacious hall you can hold events or meetings for up to 100 people. It's possible for smaller work groups to divide the hall in a few minutes - with movable partitions in up to 3 variable meeting rooms - with access to the outdoor terrace. Of course, technical equipment such as projectors, screens and Wi-Fi are standard features. Our service is more than just providing the rooms. We are happy to assist you with the organization, so you can concentrate fully on the preparation of the content - so your conference or seminar is guaranteed to be a success. When booking, ask for our conference packages! Upon request, we will put together an individual package for your event and provide you with drinks, snacks and a menu at lunch and / or in the evening. For the participants, who have another arrival, we can offer up to 12 double rooms at the moment, so that the ladies and gentlemen can start fresh and rested in their new working day the next morning. In an idyllic location, overlooking the reservoir, you and the guests of your conference also have plenty of room to think, discuss and develop new ideas and concepts in peace. Take the time and place with us to clear your head - it will be worth it!